SUMMARY: Anxious to avoid looming financial penalties for excessive hospital readmissions, healthcare organizations have tightened coordination of care and management of care transitions for Medicare beneficiaries at risk of rehospitalization. We wanted to see how healthcare organizations identify patients most at risk for returning to the hospital. 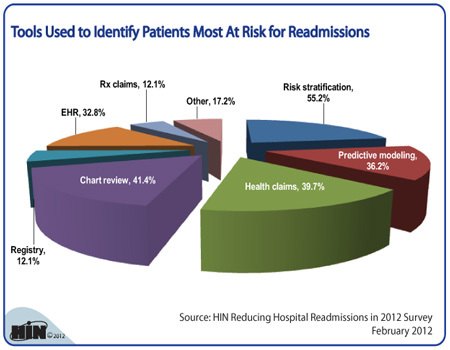 Download the executive summary of 2012 Healthcare Benchmarks: Reducing Hospital Readmissions. 2012 Healthcare Benchmarks: Reducing Hospital Readmissions, now in its third year, identifies the key strategies, challenges, target populations and health conditions of 119 healthcare organizations to reduce avoidable rehospitalizations. 2012 Healthcare Benchmarks: Reducing Hospital Readmissions is available from the Healthcare Intelligence Network for $149 by visiting our Online Bookstore or by calling toll-free (888) 446-3530.